The award-winning playwright, Hugh Leonard, has died in Dublin. He was 82 and had been ill for some time. Leonard won a Tony award in 1978 for 'Da' which formed the basis of a film starring Martin Sheen and Barnard Hughes in 1988. He wrote screenplays and adapted several books for BBC. He also adapted the James Plunkett novel, 'Strumpet City' for RTÉ Television and wrote two volumes of autobiography 'Home Before Night' in 1979 and 'Out After Dark' in 1989. His weekly humorous column for the Sunday Independent was very popular with readers for many years. Hugh Leonard was born John Keyes Byrne in 1926 in the village of Dalkey which would later feature prominently in his writing. His first wife, Paula, predeceased him. He is survived by his second wife, Kathy, and his daughter, Danielle. President Mary McAleese has expressed her sadness at the announcement saying "Hugh will be greatly missed by all who had the pleasure of his company and counsel throughout the years." She described him as "a fascinating man whom I have had the privilege of knowing personally over the last 30 years. As a playwright, journalist and radio contributor, Hugh infused his work with a unique wit, all the while demonstrating a great intuition, perceptiveness and forgiveness of human nature." The Taoiseach, Brian Cowen, said "Hugh will be remembered as a great literary figure of modern Ireland. He was one of this country's most distinguished playwrights as well as being a journalist of distinction." He continued "Hugh Leonard was a man of strong views and great wit and these traits were reflected in his writings. His Curmudgeon column which ran for many years in the Sunday Independent was required reading and was always guaranteed to raise a smile." 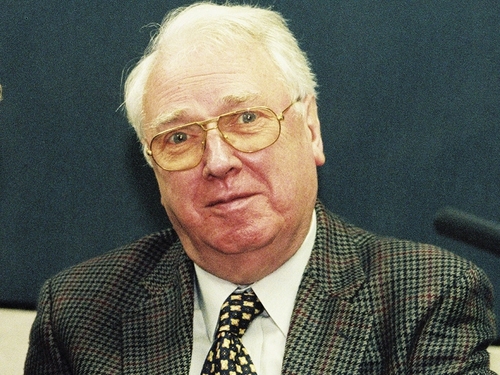 Minister for Arts, Sport and Tourism Martin Cullen has expressed his sympathy saying "Hugh Leonard's legacy is immense. As a storyteller he was creative and compelling. As an individual he was honest, engaging, with a sharp wit and an enquiring mind. His plays in particular evoked a sense of nostalgia and of the triumph of the human spirit."